There was a Braised Short Rib Ravioli with Barolo sauce, Parmiggiano Reggiano mousse and white truffle oil from Carpaccio. There was also a Pan Roasted Berkshire Pork Tederloin and Shrimp in a demi-glaze garlic sauce with smoked paprika potatoes from Mar Belo, and the Yellowtail “Hamachi” Crudo and Truffle-Wild Mushroom Tortelloni from Tre Amici. And the pièce de résistance? Well, there were WindMill hot dogs too. More than 200 food lovers packed a room at Ocean Place Resort & Spa on Monday night to sample an array of delectable dishes featured during the 4th Annual Long Branch Chef’s Challenge. 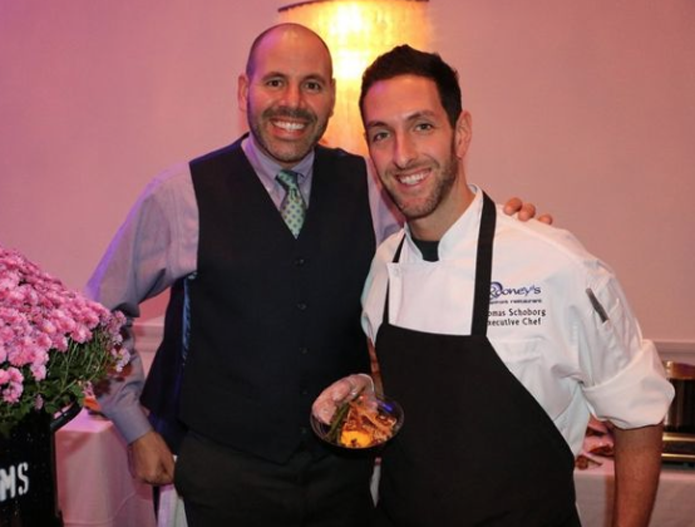 The annual culinary challenge – which benefited the Kay Guadagno Memorial Fund at Monmouth Medical Center this year – pitted more than a dozen dishes, created by chefs from Long Branch and surrounding towns, against each other. “Being a local and having grown up in Jersey, I know all of these chefs. So this is a fun, healthy competition that everyone gets to enjoy,” said Bradley Rodriguez, chef at the new Atlantic Highlands restaurant, Gaslight. Rodriguez was representing another Atlantic Highlands restaurant, Copper Canyon, on Monday night when he won the challenge’s “People’s Choice” award with Berkshire Carnitas Tacos on homemade soft yellow corn tortillas, salsa verde, pickled red onion and queso fresco. The night’s “Judge’s Choice” award winner – as chosen by judges Debbie George from The Daily Meal, radio personality Big Joe Henry, ProChef II Brian Petersen from Rutgers University and City Councilman Michael Sirianni, who is the director of the Culinary Education Center in Asbury Park – was Chef Kenneth D. Mansfield, of Sirena Ristorante, with a Mushroom Stuffed Ravioli dish. But even for the restaurants that did not win a top prize, the night was a win. Kyle Hopfensperger, the executive chef at Dive! in Sea Bright, submitted a Beach Burger with black beans, avocado, smoked Jersey Tomato chutney, Bibb lettuce and chipotle aioli served on a brioche bun. “This event is a lot of fun and it’s nice to be able to get out here to show off what you can do,” Hopfensperger said. Last year at this time, Dive! was still shuttered after sustaining significant damage from Hurricane Sandy in 2012. DiIorio said Dive! was fortunate to have been able to reopen and also fortunate to have Hopfensperger now on board. While many of the chefs have known each other for years, Rooney’s Oceanfront Restaurant’s new chef Thomas Schoborg has only been in the Long Branch restaurant scene for five weeks. But on Monday night, his Pecan-Crusted Rainbow Trout was competing against dishes from Jersey Shore veterans. And that, Rooney’s General Manager Darrell Wordelmann said, is part of what makes the restaurant scene around Long Branch so great. A thriving and vibrant restaurant scene will only aid the ongoing revitalization efforts in Long Branch, officials said. “It’s great for business, it’s great for our locals, and it’s great for the people who come to visit, because a lot of people make Long Branch a destination,” said Lisa Kanda, a board member on the city’s Chamber of Commerce. “It speaks to the whole city and the renaissance that’s going on here,” Chamber of Commerce Board Member Bob Wozmak said.